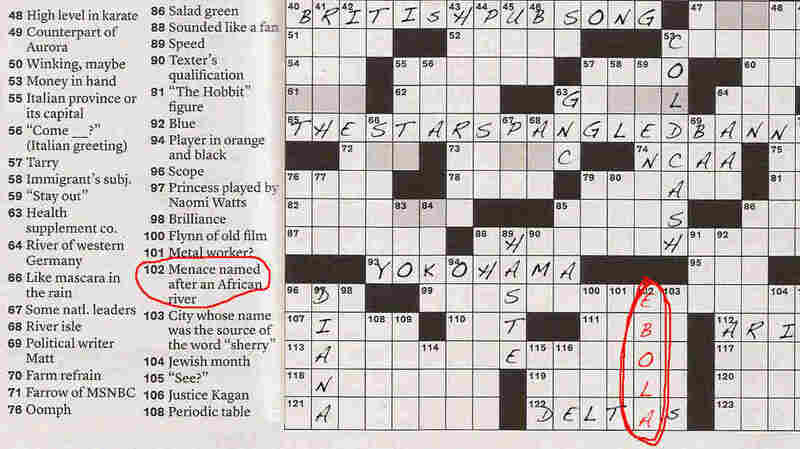 Ebola Invades 'The New York Times' Sunday Crossword : Goats and Soda Crossword puzzles steer away from diseases. They're too depressing! But they have a habit of sneaking in. Here's a look at clues used by The New York Times for some infamous global health ailments. Last Sunday I literally was clueless about a New York Times crossword puzzle clue: "Menace named after an African river." The answer was five letters long. WHAT WERE THEY?!?! I finally did figure out the answer from the crossing words: Ebola. And that's how I learned the origin of the name of this frightening virus, which is making headlines this year because of an outbreak in West Africa. I was curious whether other infamous global health ailments have appeared in the Times crossword. So I asked puzzle editor (and NPR puzzle master) Will Shortz. "Crosswords tend to avoid unpleasant subjects like diseases — but occasionally the names do slip in unavoidably," he wrote in an email. Shortz graciously provided a list of all the New York Times crossword clues he's published for Ebola and other diseases on a short list I sent. Here they are, with the number of times they've appeared. They're kind of like a haiku of disease — and they definitely are enlightening. So that's what malaria means! Modern term for "Roman fever"
This has never appeared in a New York Times crossword because answers must have at least three letters. Also a no-go because MERS is plural French for "seas." So that's what the clue would be.